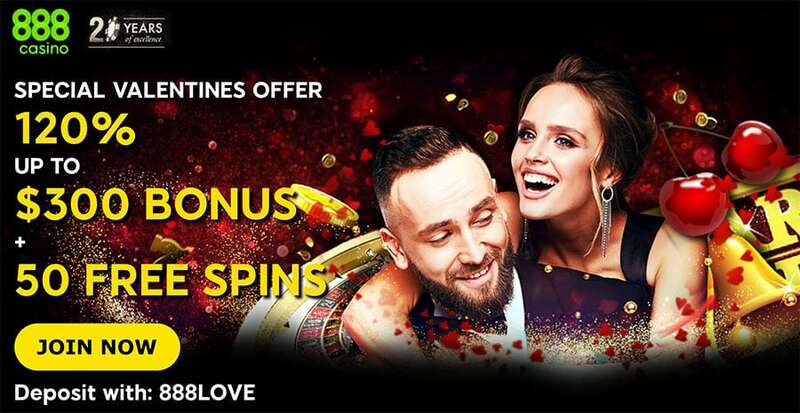 Claim Your Valentine Offer at 888Casino Now! If you thought that there was no chance that Valentine’s Day can surprise you any more, you were wrong. This time the surprise comes courtesy of 888Casino and their Special Valentine’s Offer. We all know that new players are a commodity for all casinos. Because of this, they create their most generous and rewarding promos specially for them. We have seen welcome bonuses which award players with 50%, 75%, and even 100% on their initial deposits. However, we have never seen any casino going over the 100% threshold. 888Casino did exactly this. Their Valentine’s offer is unlike anything you have seen before. It may not come covered in candy or with lots of roses, but boy does it pay well. And it is a real breeze to activate it too. This Special Valentine’s promo gives 888Casino’s new clients the chance to benefit in more than one way. Most prominently, they can get an amazing 120% on their initial deposit. This is a mind-boggling up to €300 Welcome Bonus. In addition, they can also get an additional 50 free spins. And if that wasn’t enough, new players can enjoy the best games at the number one casino establishment. This means that if your initial deposit is €100, you will get more than you deposited as a welcome bonus. To be exact, you will get an additional €120 to play with. A total of €220 to open the winnings floodgates. That is of course excluding the free spins. If you get lucky, those free spins can bring you even more money. Much more money. Let’s say you are casually looking at the progressive jackpots and thinking of giving them a spin or two. After all, you have 50 free spins. Well, if your luck smiles there, even Cupid himself will envy your embarrassing riches. Activating the offer can be done in three simple steps. First, you register with the casino. In the second step, you make your deposit with the 888LOVE bonus code. It is here where you claim your bonus and free spins. Finally, you can start playing with all that money at hand. However, you have to act fast. Love may last forever, but Valentine’s Day doesn’t. Neither does this offer. The offer is valid from 4 February 2019 to 15 February 2019. It is only in this short window that you can make full use of the amazing promotion. In order to be eligible for this offer players must deposit a minimum of €20. As soon as they have done this, the bonus money and the free spins will be credited to their account. We are sure that you won’t forget, but entering the 888LOVE bonus code is absolutely a must. If you don’t do that, you will not qualify for this special promotion. It should also be noted that there are certain wagering requirements related to this bonus. To withdraw the bonus and winnings generated by free spins, players must fulfil a 30x wagering requirement. This means that the relevant bonus amount must be wagered 30 times within 90 days of receipt. 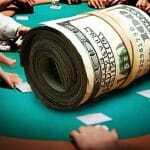 Wagering on all games at the site contributes to the wagering requirement. However, we recommend that you check out how much each individual game contributes before you start wagering. This is because different games contribute differently. This Valentine’s Day can be made more memorable than ever. 888Casino has done its part. Now it is up to you to make the next step and start spinning and winning.